DoubleDown Casino features Player's Suite® Blackjack. Face cards (Kings, Queens, and Jacks) are worth 10. Aces can be worth 1 or 11. 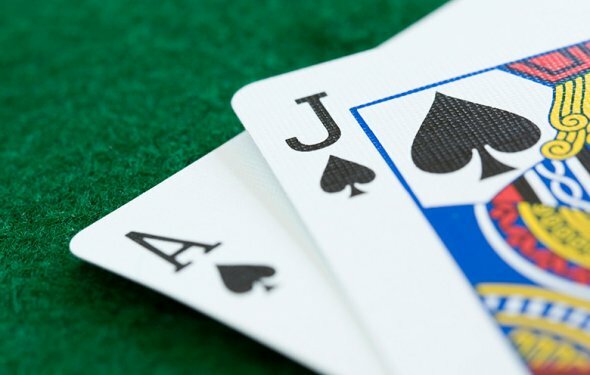 The game will automatically choose the value for Aces to give you the best hand. Numbered cards (2 through 10) are worth their face value. The suits of the cards do not affect the hand in Blackjack. Player's Suite® Blackjack uses six decks of cards to build its play deck. The play deck is shuffled in full after each hand. To view the rules and the key to the game controls at any time while playing, tap . To begin playing, place a bet. Select an amount by tapping one of the four chip icons on the lower left. Your starting bet can be as low as 5, 000 chips (5K) or as high as 5, 000, 000 chips (5M). Once you have selected your starting bet, tap the glowing circle at the center of the table to place your chips down. You can tap a different chip icon and tap the circle again to add both chips to your current bet. The total bet will be displayed just below the circle. Tap 2x to double the current amount, Clear to start over, and Deal when you are ready to start the hand. At the beginning of a Blackjack hand, the dealer gives you two cards, face up. The dealer takes two cards as well, one up and one down. You can choose to Hit, Stand, or Double Down. If the first two cards you receive are of equal value (a 10 and a face card, for example), you will have another option: Split. Take another card from the dealer. This action may be repeated until you choose to Stand or until your card total exceeds 21 and you go bust. Accept your current hand as final. No more cards will be dealt to you, and it is now the dealer's turn. Take exactly one card from the dealer and double your bet for this hand. You cannot choose to Hit after you have Doubled Down. If the first two cards you receive are of equal value (a 10 and a face card, for example), you can Split the hand. The cards will be separated into two hands that you can play individually. This automatically adds chips to double the original bet, so that each of the split hands has the same wager. Splitting is covered in greater detail in the advanced Blackjack rules. The word Blackjack refers to a winning combination where exactly two cards add up to 21. This combination is made up of one face card or 10 and one Ace. A winning Blackjack pays out at 3 to 2. This means that a 1, 000 chip bet pays out 2, 500 for a Blackjack.